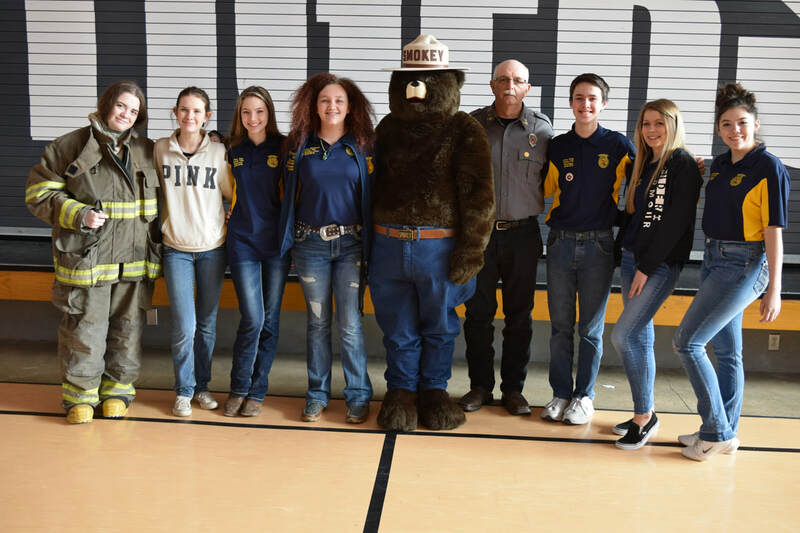 On Friday, February 8, Exeter FFA planned and presented a first-of-its-kind special visit in Missouri for Exeter Elementary from famous fire safety and wildfire awareness advocate Smokey the Bear. The wildfire prevention and fire safety presentation focused on teaching students pre-K through fourth grade what to do if they are in a house fire, the number to call if there’s a fire, EDITH (Exit Drill In The Home) and how to best prevent a wildfire. Wildfire prevention is important with the location of many camping sites and forests in our area such as Roaring River State Park. Wildfire prevention tips include not playing with fire, never leaving a campfire unattended, always making sure that you put fires out completely before leaving site, and even just taking notice of the weather before you think about burning trash or making s’mores. Smokey then visited each classroom to drop off bags of goodies for the students. Submitted by Riley Still. Smokey poses with the Exeter FFA officer team, pictured from left to right: Mykah Estes, Savannah Jones, Riley Still, Yvonne Bradford, Smokey (Wyatt Hoppes), Smokey Bear coordinator Ron Brown, Lane Willis, Macy Barrett and Vanessa Ward. They are led by FFA adviser Rachael Brown.